On Saturday, twelve of us gathered at Lakeside Retreats to take part in an Earth Honouring tarot circle experience. We used the open sentences from my Earth Day tarot circle game to focus our intention for the afternoon. People who had been in circles before or who had used tarot in some capacity before saw, yet again, the power of authentic engagement in action. Those who had never taken part in a council-style circle before or who had no prior tarot experience were surprised at how easily they and their fellow participants plumbed profound inner territory and expressed honest personal truths. It was heartening to see that 1/3 of our group was men. 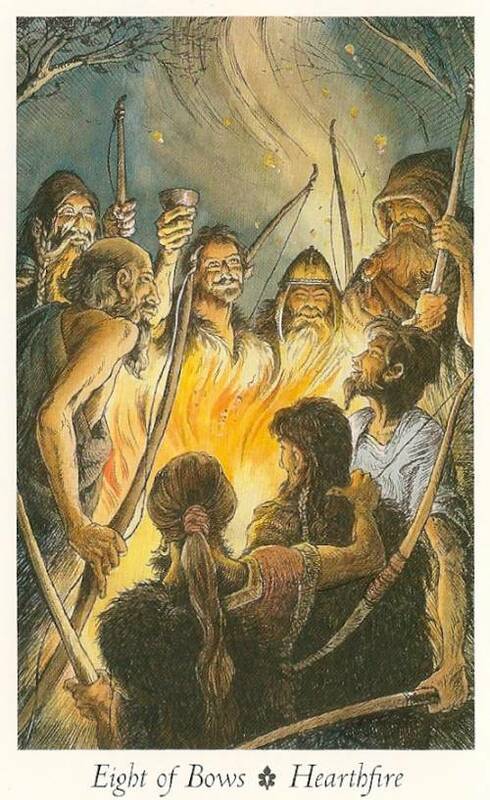 The card I received in the final round of council to indicate my meaningful Earth-healing assignment was the Eight of Earth from the Gaian Tarot (see above). There’s something here about apprenticing myself to the voice/sound of the Earth, listening carefully to Her rhythms, and maybe something as obvious as my drum and I spending time with the Earth. Let these processes be my current assignment, then let what I hear teach me the deeper calling. 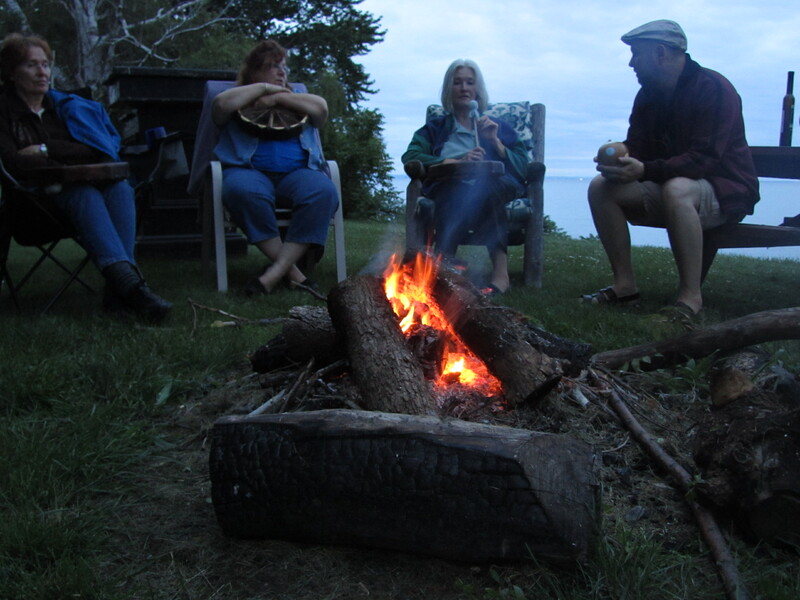 After the circle, we savoured a pot-luck meal outside, then drummed and chatted around the bonfire as night fell. A glorious continuation of Summer Solstice celebrations! 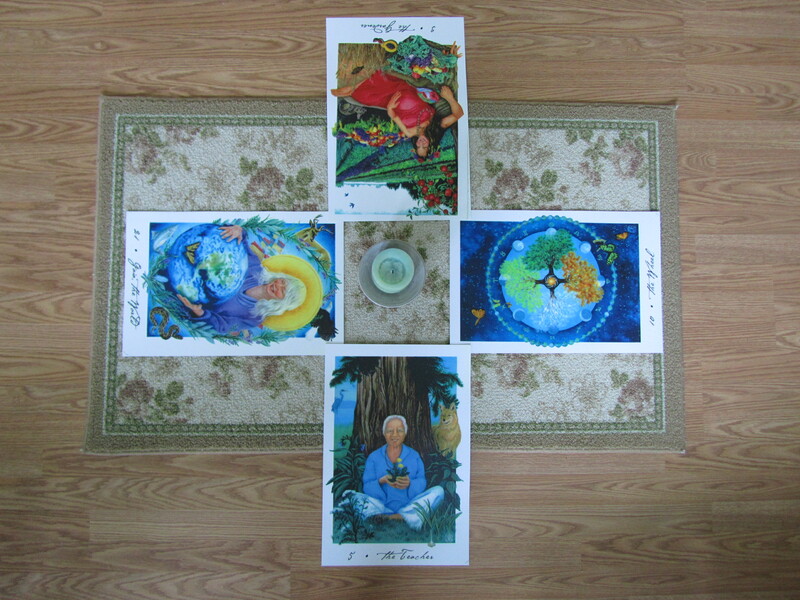 In the centre of our circle, we placed large Gaian Tarot images to represent our intention. Conversation and fun around the bonfire. That's me on the right with my round gourd rattle. A. Gather in a circle, whether around a table, on the floor, or on the ground. Place a beeswax candle in the middle. Remove any card(s) from your tarot deck that reminds you of Summer or the Solstice. Place this card(s) in the centre beside the candle to represent your intention for gathering. You can also add seasonal flowers and fruits to the central space. B. One at a time, each person receives the tarot deck as it’s passed clockwise. Each person, when s/he receives the pack, says one word or one phrase that lets the group know how s/he is as s/he enters this game(e.g. “I’m feeling grateful for X this evening.” or “I’m tired, but happy to be with you all today.” or “I’m curious about what we’re about to do.”). If the players are new to one another, it’s a good idea to speak your name as well. Then s/he mixes the deck and picks three cards at random before passing the pack to the person on hir left. This continues until everyone has checked in and has three cards in their hands. C. Three rounds are played clockwise (each round’s topic is below). During each, every player gets a turn to lay a card on the surface in front of hir and use its image to inspire a continuation of the open sentence provided. This can be done by consciously selecting a card from your face-up hand or by keeping your three cards face-down and intuitively picking which one will be your sentence-completion image. Each player can expand on the sentence as much as s/he chooses. D. After everyone’s cards have been played, allow a fruitful, respectful conversation to unfold, continuing until it reaches a natural conclusion. E. For the final round, the tarot deck is passed around counterclockwise. One at a time, people receive it, express gratitude for one thing they’ve heard or said during the game, mix their three cards back into the pack, and pass it to the person on their right. F. After everyone’s cards have been returned to the deck, the central card is shuffled back into the pack. Extinguish the candle. You can enhance your Summer Solstice tarot circle game experience by reading poems or singing songs that are relevant to the occasion. This can be done between parts A & B and between parts E & F. Your time together can be extended by savouring a picnic after the game. 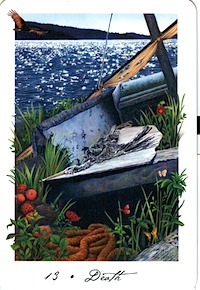 * Image: The Eight of Bows from the Wildwood Tarot. I recently did a small survey about conversations that matter. Some people had been in a more structured circle format, others had been in less formal circumstances. Either way, here are my questions and people’s responses. 1. When you remember the most engaging conversation you’ve ever had, what made it so? Connection between myself and the other person. Paying attention when they speak and not talking over them. Turning attention to the other. Nothing to hide behind (no table or desk), so we were open to one another. Saying what I really mean. Pausing instead of rushing to say the next thing. Sitting in a circular chair arrangement. Facing one another. Candlelight and quiet music while we talked. Unedited brainstorming around a common objective. Talking about larger world issues. Limited use of words (it was with a post-stroke patient). 2. What tangible benefits came out of that engaging conversation? What I say matters, what you say matters. Who I am matters, who you are matters. Discovering that it’s not all about me. Opens deeper wisdom and understanding. I am a necessary link in the continuum. I’m not alone. The sense of being an integral part of a larger whole. Less tension because there’s less unspoken stuff. I sleep better at night! Service to each other in the group and to our community. Solved our own problems by talking about world issues! Depth of awareness and strength. What are YOUR responses to these questions, my friends? If you’re interested in discovering what circle-based conversations can do for YOU, please join Bev Haskins and me for a weekend circle practicum, July 15 through 17. You can sign up HERE. Forty-four years ago today, I was born in a powerful thunderstorm. Today, according to the system of calculating Year Cards that I use, I enter a year of the World card (trump # 21 in the tarot). I look forward to exploring its themes of conscious choice, wholeness, the world being my oyster, being the entire tarot, trying on my multiple selves, dancing for joy to the rhythm of the Cosmos, and having many options available to me. I love that my birthday and the release of my book, Tarot for Manifestation, coincide. A double celebration! This evening, a simple dinner with my beloved. On Saturday, a party with friends and family. Thank you, Life, for the gift of life. Blessed be! Today began well. I walked to the valley and performed a divination for myself using Jesse Wolf Hardin’s Gifting Bones. It felt like a true pilgrimage to an oracle site. My descent took place through the woods. The Monster Guardian at the Threshold was a red-winged blackbird who took a swat at my straw fedora. The temple was a mostly-shaded rock. I respectfully offered cornmeal and tobacco to the place and its beings. Then I smudged myself, the immediate area, and my tools (Gifting Bones, journal, pen, cloth) with sage smoke, taking care to place the match and smouldering leaf into a tin can afterward. After reflecting on the layout I chose (the Elder of Fire spread I created in NYC), I reached into the fabric pouch and drew five cool ceramic “bones”. WisdomSource’s guidance came to me clearly as I spent time with each image and jotted ideas in my journal, accompanied by the croaking of frogs and whirring of more red-winged blackbirds. My life and work in the world were affirmed, something that came up in Monday’s mastermind circle was reinforced, and I was shown an attitude to clear out of my consciousness. I smudged again and put away my sacred implements, giving thanks to all the beings and to WisdomSource for their presence, voices, and guidance. The ascent through the trees seemed extra sweet, acacia perfuming my return to the quotidian. My next step will be to do the same layout with the Gaian Tarot. The third step will be to integrate the two explorations into a comprehensive whole. I highly recommend being outside to connect with whatever/whomever you know your WisdomSource to be. I invite those who wish to have their private sessions with me in this manner to let me know. Weather permitting, I’d love to make an oracular pilgrimage with you, letting All of Life speak to us, not only through cards, bones, or whatever, but also through the breeze in the leaves, frogsong, and wingwhirring. Yesterday, I was in council and ceremony with my peers at Daré, a gathering for peacemaking and healing. Today, I was in council with my peers in mastermind circle, a gathering to support ourselves and each other as self-employed cultural creatives. I find it helpful to jot synopses of my circle-based meetings, gatherings, ceremonies, etc. in my journal. These might be quotes from circlemates, book titles, questions that emerge for me, or actions to take. It’s a way for me to take the wisdom of the assembly into the world, yet not betray confidentiality. Examples below. The way to mend is to hold and embrace. Pay attention to what’s in the field so that I can act/speak accordingly. How might I translate the poetic language of my soulcentric work into a grounded, everyday text that will appeal to a wider audience without compromising its essence? BOOK. “The Divine Feminine Fire: Creativity and Your Yearning to Express Your Self” (Teri Degler). How might I let people know that group experiences I offer (classes, workshops, circles, etc.) can be as profound and personal as a private consultation? A couple of nights ago, Joanna Powell Colbert, via the Gaian Tarot Circle, led a teleseminar on the Death card in the Gaian Tarot. I was unable to participate directly this time, but listened to the reocrding of it the next morning. After listening to this beautiful conversation, I was struck by how many of us need music, ceremony, and respectful holding/witnessing in times of death, whether that of a person or that of a situation or idea. What emerges for me from this version of the Death card and the conversation around it is that it’s not death itself that people are afraid of or uncertain about, it’s dying. Questions such as, “Will I feel it?”, “Will it be painful?”, “If it’s painful, will I be aware of that pain and begin to panic about it?”, “If it’s violent, will I feel everything?” ,”Is there anything beyond dying that I’ll become aware of?” and “Will that be the total end of me?” come to mind. So it’s very good to know about the sacred work of people like Nora Cedarwind who is a midwife to the dying. To be held, washed, and sung to is a reassuring alternative to entering a mindspin about what might happen. As tarot practitioners, perhaps we’re also called, in a sense, to be midwives of death/dying. Relationships falter, jobs end, friends betray trust, people give up a familiar home to move somewhere else. There is, I believe, a piece of the unconscious that experiences *all* change as death. How might we tarot folks find the courage to shepherd, companion, and midwife those who come to us with their concerns about life’s changes, transitions, and endings? How might we carry out that shepherding, companioning, and midwifing with grace? Going back to my first sentence, perhaps we could remember that a tarot consultation is a ceremonial holding of the situation and we can do our best to shape an experience that honours what is happening for people. How might YOU do so? I’d love to hear about that.